You will be given a Free reference e-book to read which has 810 pages And the test will be based on that e-book. OCP Oracle 8i DBA performance tuning and network administration certification test aims to measure the knowledge and skills of an aspiring certified expert in the field when it comes to efficiently and correctly tuning and administering the network performance of Oracle 8i. Note that you cannot just take and pass this certification test without preparing for it. Remember that there are certain topics that you need to master to be able to improve your ability to handle all the questions of the exam well. To pass the certification test, you need to have a more comprehensive overview about the Oracle 8i database tuning process, configuring the database and resolving or troubleshooting I/O issues, dealing with Oracle trace files and alerts, reducing redo operations, different dynamic and utilities performance views and redo log buffer tuning. You also need to have a full understanding about the entire Oracle 8i architecture so you will have an easier time administering its network. Learning more about client-side configuration, names server concept definition, naming concepts centralization and shared servers configuration is also a crucial step towards effectively handling the test. Fortunately, you can now easily gather more information about all the topics usually included in the actual OCP Oracle 8i DBA performance tuning and network administration certification test with the presence of the free OCP Oracle 8i DBA practice course from Brainmeasures. It features a free study guide and practice test both of which are valuable when attempting to efficiently prepare for the actual exam. 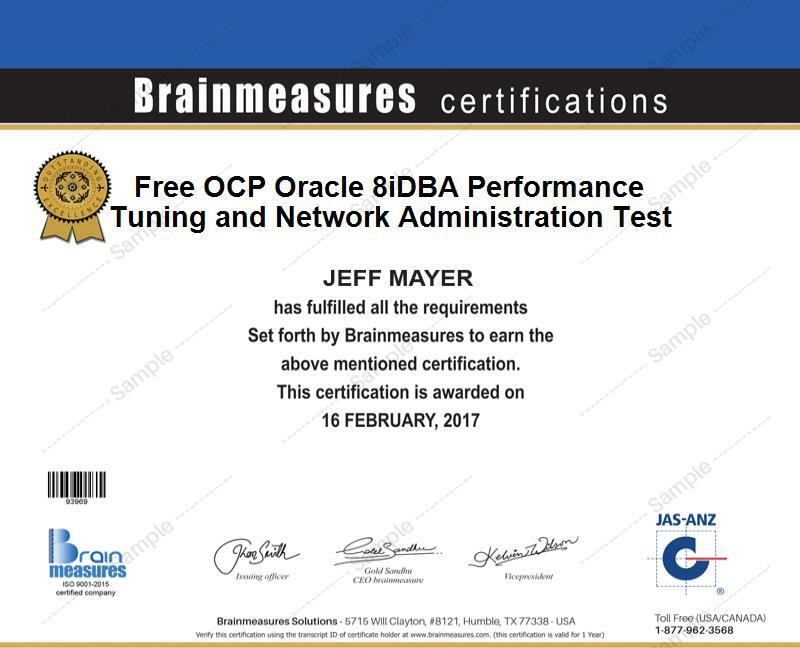 The free OCP Oracle 8i DBA practice course introduced by Brainmeasures to the public has the most extensive free Oracle 8i DBA performance tuning and network administration test designed to be extremely helpful if you have plans of mastering every topic related to the actual certification exam. The free study guide included in this specific free practice course from a renowned online certification company is guaranteed to cover the most vital concepts and topics linked to taking the certification test. It offers the most extensive and detailed explanation about all the things that you need to fully understand about the field. The good thing about the practice course is that its free practice test is also created in such a way that all those who desire to become even more familiar about the whole certification exam environment becomes more proficient in the field. The free OCP Oracle 8i DBA performance tuning and network administration test featured in the free OCP Oracle 8i DBA practice course offered by Brainmeasures as well as all the other features included in the practice course are really valuable for those who plan to become a successful passer of the actual certification test. The entire practice course is actually designed for all aspiring and existing Oracle 8i database administrators, managers, consultants, analysts, engineers and any other professionals who are contemplating on specializing in using Oracle 8i. Another remarkable result of successfully passing the OCP Oracle 8i DBA performance tuning and network administration certification test is that it helps you in receiving an even higher salary. Working as an Oracle 8i database administrator can actually assist you in generating around $42,000 to $116,000 yearly. If you work as an Oracle Certified Professional (OCP), then earning approximately $53,000 to $129,000 every year is possible.